Every year comes with new trendy words. In 2018, we could say that the best candidates for this category are ‘blockchain’, ‘artificial intelligence’ and, of course, ‘chatbot’. Endless articles and big promises of how your life will change thanks to them have started to appear everywhere and it seems that they have gone from unknown to essential from night to day. In this post we will try and explain what they are, what they’re for, their limitations, what you should look for in them and the benefits that they can bring to your hotel services and direct sales. A chatbot is a technological tool in the shape of an assistant which helps you automatise the service for your clients in the different digital channels you have: your website (mainly) but also your Facebook page or directly on your business’ WhatsApp. This assistant can help answer questions to clients in a quick and simple way. Although right now the norm is to understand written text, where there is still a long way to go, with time we will see chatbots which understand voice, something which would be a real disruptive change in the use of technology. When we were referring to answering questions, we meant an endless list of potential questions which can naturally emerge when choosing one hotel over the other or even once your hotel has been chosen. Examples of this are Do you serve gluten-free breakfast? Do you have children’s entertainment? or simply What time does the swimming pool open? Clients (myself included) are capable of browsing on dozens of websites (among them many OTAs) and even visit actual travel agencies to look for answers to their questions. The website which answers them will also be where they will feel comfortable booking. In the end, a chatbot is not too different from the classic voicemail which guides you when you call your local phone or electric utility company, and if it is properly configured and taught, it can solve your enquiries in an efficient manner. Otherwise, it can be torture which generates a deep sense of frustration and anger. Many hotels already have a live chat on their websites. It is a technological tool which allows the hotel to chat in real time with clients who visit their website. Unlike chatbots, a live chat requires human intervention (normally the reception or customer service team). As we will see later on, the live chat function is very complementary and many chatbots are incorporating it. The user is in constant change and you can’t expect that what used to work ten years ago still works today. Internet speed and technological advances have radically changed our behaviour. What could wait in the past can no longer wait today. We are not willing to look for information browsing on different websites. We use chats with ease and look for quick answers. We increasingly want to use our voice awaiting a precise and immediate result. In short, we are fussier and more demanding. Who would have thought just two years ago that we could do searches and, coming soon, purchases with our voice? That fridges would automatically do the shopping? Or that our signature would be substituted by facial recognition? All of this is not far from becoming a reality. These changes are unstoppable and their adoption will be very quick. 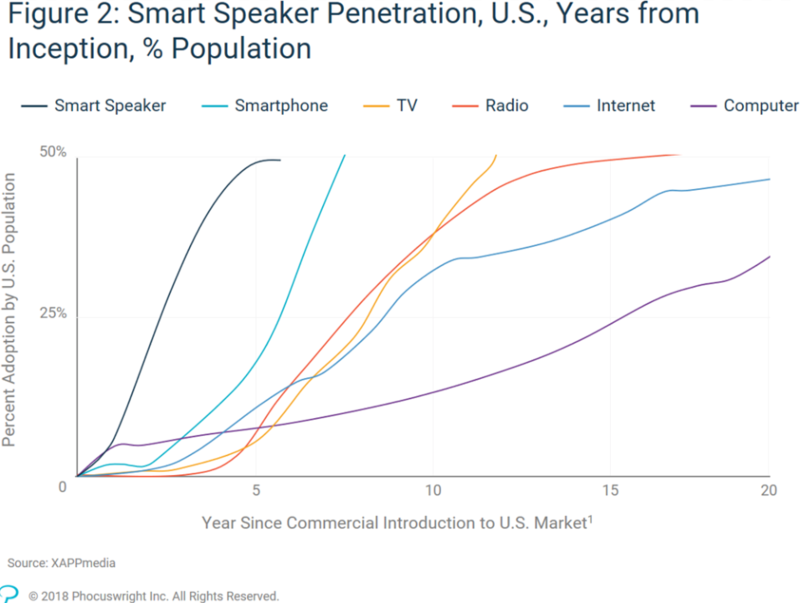 Going back to the use of the voice, Phocuswright estimates that it will not exceed 5 years, very inferior to the use of a mobile phone which was 8 years and light years away from the computer which was 20 years. More specifically, in the travel industry, another study by Phocuswright points out the unstoppable rise of the use of voice assistants for everyday activities such as searching for a hotel or a flight. As expected, the lowest age range (18-34) is the one in which the use of the voice is more widespread. All these changes, whether we like it or not, will directly affect hotel distribution. Those hotels which adapt to it before will be better prepared to compete with the rest and also with their own intermediation. It’s time to get to work and start this change because OTAs and metasearch engines are already working hard on this, aware that this technological revolution can be lead by them and thus increase their dominance over the hotel industry on the Internet. However, it’s not OTAs but rather the big technologies that have already made a commercial use out of this revolution, such as Google Home, based on its technology Google Assistant; Amazon’s Alexa, and Apple’s new HomePod. 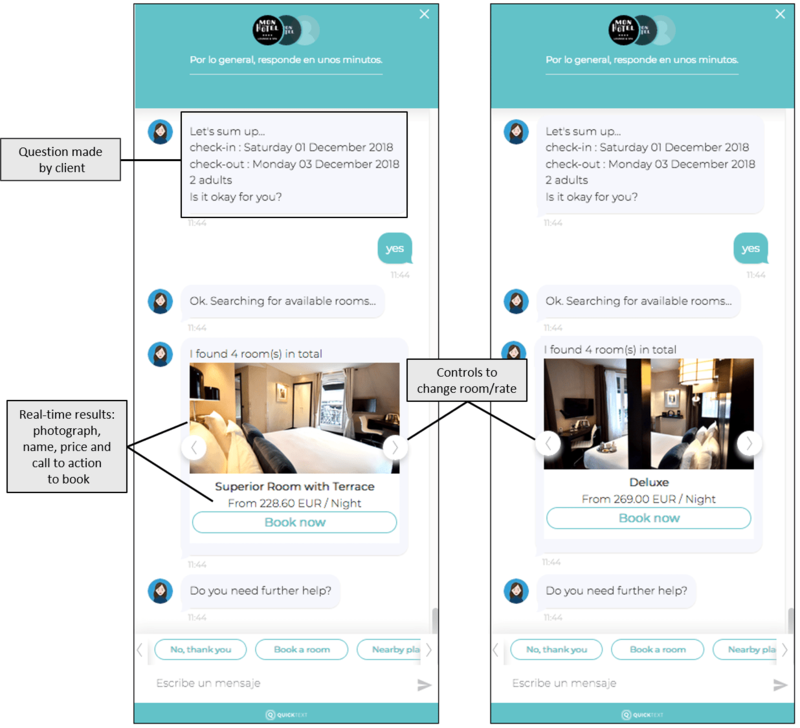 What should you look for in a chatbot for your hotel? Facility to add and personalise questions and answers which are important to your hotel. Don’t settle for the typical questions. You should aim to solve all questions that your clients have and you probably have many of them identified already. Most of the chatbot’s success will reside in this personalisation. Option to attach links, images or PDF files with more information in your answers to the client. For example, when asked How much does the spa circuit cost? what better way to answer that than attaching a link to the spa’s website and PDF file with the services and prices on top of the actual price. As well as a satisfied client you could boost upselling. Full functionality on mobile devices –not just desktop– as well as compatibility with the market’s most popular browsers (Chrome, Firefox, Safari, Internet Explorer, etc.). Availability in the language of your most important markets of origin and functionality to auto-translate the texts that you write in your language. 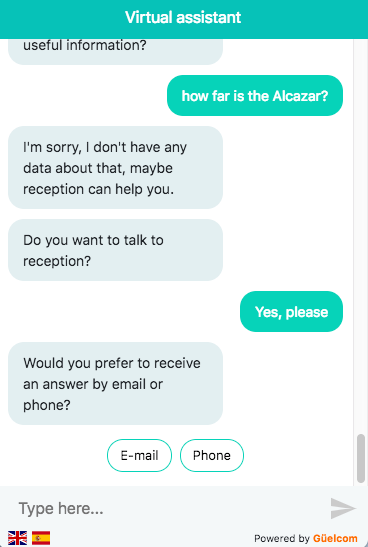 Option of connecting the client with a human hotel agent for a more personalised service. Some products offer to activate both alternatives (live chat and automatic assistant). In this example from Quicktext you can see how this option can be configured by the hotel from its extranet. 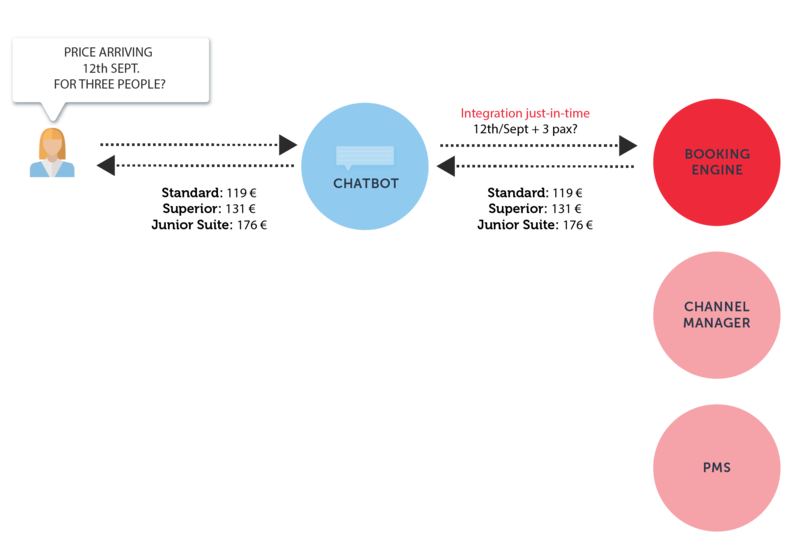 Organised access grouped with the issues that the chatbot has not managed to resolve, so that you can add these questions to the chatbot and thus improve its success ratio. 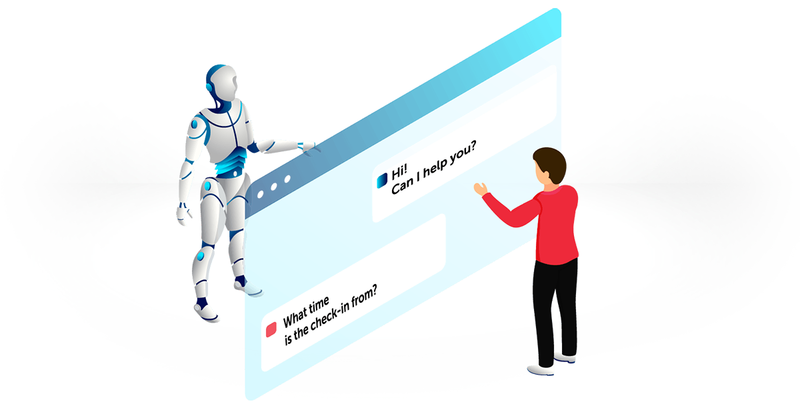 Self-learning so that the chatbot itself offers approximate answers to questions it has not been trained for so that it can gradually and autonomously correct them. Machine learning and artificial intelligence are essential to develop this point, which has immense potential despite being at an initial phase. Compatibility not just with your website but also with other digital platforms such as Facebook or WhatsApp, which has just opened up to integrations although still with many restrictions. · Giving the client the cost of a specific room for a specific number of people. For example: How much does a room cost for 2 people from April 18th to the 21st? · Specifying number of adults and children, as well as their ages (if your prices are different depending on age). · Offering not just the cheapest room but rather all available rooms and/or rates, thus facilitating upselling of superior products. · Helping clients who have a promo code that, like in the booking engine, can also check it via chatbot. · Differentiating your price depending on country and/or device if your prices are subjected to these variables. This functionality is very important for holiday hotels. · Having given the quotation, provide the client with the link to book in a simple way. Possibility of gathering data of interested clients to contact them in the future (via email, SMS or Facebook depending on the channel they selected). Compliance with GDPR in this case. ‘Call me back’ option if it doesn’t find a reply to the question. Traceability and performance measuring. Knowing the success ratio for each market, device, average enquiry duration and any variable which allows you to evaluate if the functioning is good or not. Last but not least, the service. Every novelty, especially during the initial phase, comes with questions and doubts. Having someone who can answer them quickly and efficiently definitely adds a lot of value. Understanding voices in the different languages you support. Differentiating accents. Spanish spoken by someone from Asturias and someone from the Canary Islands is completely different. As is the case with English when spoken by someone from Scotland or New York City. Same language, thousands of variations. Use of natural language. When we talk, we assume things that when in writing we are used to explaining in more detail. It’s not the same when the user writes weather in Madrid’ than ‘is it raining today?’. Human response. Who doesn’t prefer talking to an actual natural human voice than to a robot? The satisfaction is much greater. In any case, not all hotels need all of these functionalities and nor is it easy to find a chatbot which does all of these things. Therefore, it is important to analyse your needs and identify your requirements properly so you can make a more informed decision on which chatbot to choose. · Do you have adjoining rooms? · Is Wi-Fi free? How fast is it? · Do you have a gym? What time does it open? · How do I get to the hotel from the airport? · Can I send a shipment from Amazon to the hotel? · Do you have pool towels? · What time does the entertainment programme for children start? · Which excursions are planned for today? · What is on the restaurant menu today? · I need an invoice. · I forgot my mobile charger in room 417. · The restaurant charged me twice. Chatbots, a new way of booking? There are companies that value being able to book through a chatbot above everything else. Between 30% and 50% of enquiries received via their chatbot are somehow related to a booking, a high percentage which we must understand with caution. There are endless questions related to a booking such as how to check prices, what are the cancellation policies or knowing what a rate includes. Where is the line between asking and wanting to book? The action of completing the booking on the chatbot should not be an objective in itself. The most important objective is to clarify all questions which may come up and thus give the client that final push to book. Whether he does it via chatbot or website booking system is irrelevant. In order to solve the most common question related to bookings, which is knowing how much a room costs on a specific day, or what we call booking enquiry, the chatbot that you choose must be able to provide the client in real time with the exact price of his enquiry which should coherently be the same price offered in your booking engine. Therefore, it is an essential requirement that the chatbot that you choose has an integration with either your booking engine, your channel manager or the PMS so that it can provide these quotations. Remember that if you price differently per market or have exclusive offers for mobile devices, it is also essential that your chatbot can differentiate these rates and maintain coherence with the prices offered through your booking engine. In this enquiry, the assistant should show in a friendly and clear manner the different rooms and available rates, thus enabling upselling of more expensive products and not just highlight the cheapest rate. Once the client chooses an option, he will want to complete his booking, whether it is on the booking engine itself (for which the chatbot should redirect him naturally) or via the chatbot itself. The latter option, despite being technically possible, comes with many challenges that you must ensure are properly sorted out or it may turn out to be counterproductive. Security. Working with credit card details is increasingly demanding in terms of regulations. PCI regulations and the GDPR are essential requirements that the chatbot must comply with. Upselling. Booking engines are used to offering upselling options or extras during the booking process. You must make your chatbot offer these same options. Payment method. Alternative payment methods such as online TPV (with 3DS security) or Amazon Pay are increasingly commonplace. These payment methods should therefore be added to the chatbots to make bookings. Traceability. All transactions which are carried out on your website are registered on Google Analytics, whether it is in terms of source and channel level or client country and device. Maintaining this traceability is key to turning your chatbot into a booking tool and continue knowing the profitability of your marketing campaigns. For months now, we have worked on the integration of different chatbots or third-party assistants which allow for a good integration with hotel websites or other digital platforms such as Facebook or WhatsApp. 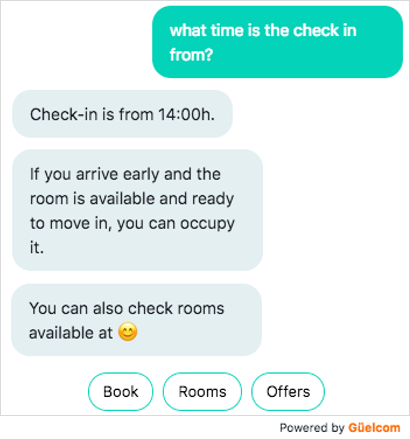 Currently, we have integration with Güelcom chatbots and the one recently launched by Booklyng, as well as with Quicktext, a tool which, aside from its many functionalities which improve hotel-client communication, also has a powerful chatbot. We are still working and are open to integrating any chatbot with our clients’ websites, as well as being able to provide real-time quotations through integration with our booking engine. Incorporating a chatbot seems like a good decision. It will help you improve communication with your clients, give them a higher degree of satisfaction, generate additional sales for the hotel (from those which you may have lost in the past for not being able to quickly and promptly answer their questions) and boost your direct channel (because by answering more questions on your own website you reduce the probability that clients go to OTAs in search for answers). However, I fear that chatbots are not something you can install and forget about. Their success will mostly depend on the use you give it. You will only be successful if you configure it properly, dedicate time to it, pay attention to whether it’s working properly and improve it every month with new questions or by correcting the current ones. Otherwise, it may be counterproductive and generate the opposite effect: unsatisfied and frustrated clients. Like almost everything in life, technology does not make a difference if it’s not used properly. However, with a good product and a correct use you can offer an alternative to your clients which clearly sets you apart from the rest.